Hall of Famers: Blue Jays: Pat Gillick (GM), Roberto Alomar, Dave Winfield. Braves: Bobby Cox (mgr), Tom Glavine, John Smoltz. 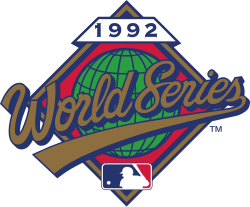 The 1992 World Series was the first World Series ever with games played outside the United States, following the 1992 regular season. It pitted the American League champions Toronto Blue Jays against the National League champions Atlanta Braves. Braves fans had plenty to worry about in regard to both starting pitchers. Tom Glavine's post-season career had been less than stellar, including giving up eight runs in the second inning of Game 6 of the NLCS against Pittsburgh. Entering Game 1, Glavine's career post-season record was 1–5 despite two starts where he had pitched well and only given up one earned run each time. Glavine was 0–2 in those starts. In addition to Glavine's struggles in the postseason, the Braves would be facing their nemesis from the previous postseason. In the offseason, the Blue Jays signed free agent pitcher Jack Morris to be the ace of their staff. Morris was coming off a 1991 World Series performance that saw him win series MVP and two of his three starts for the Minnesota Twins against the Braves. One of those starts was the now-famous seventh game, where Morris pitched a rare ten inning complete game shutout as the Twins rallied to win 1-0. While his 1991 postseason had been historic, Morris' 1992 postseason had been far from it to this point. He lost Game 1 of the ALCS against Oakland despite a complete game, and gave up five runs in the third inning of Game 4 but ended up with a no-decision after Toronto rallied for an extra-inning victory. Glavine gave up a home run to Joe Carter in the fourth for the first run of the Series, while Morris shut the Braves out for five innings. In the sixth, with two runners on and two out Damon Berryhill golfed a Morris pitch over the right-field wall for a three-run homer. It was all the offense Atlanta needed, and the Braves took the game by a 3–1 count. Glavine went the distance for the victory, only giving up four total hits. In taking the loss, Morris suffered his first career World Series defeat in his sixth start, with one no-decision. Berryhill's home run marked the first runs Morris had given up in the World Series since a Terry Pendleton home run in the bottom of the third inning of Game 4 of the 1991 Series. Morris pitched an additional 3 1⁄3 innings in that game, all ten in Game 7, and the first 5 2⁄3 innings of this game to run his scoreless innings streak in the World Series to 19. Before the game started, during the performance of the National Anthems of the United States and Canada, the U.S. Marine Corps Color Guard accidentally flew the flag of Canada upside down The Corps apologized for the error and took pains to carry the flag properly prior to Game 3 in Toronto after insisting that they would be honored to do so.. On top of that, Canadian rock/country musician Tom Cochrane sang the Canadian national anthem incorrectly. Instead of singing the line "... from far and wide, O Canada, we stand on guard for thee ...", Cochrane instead sang a lyric that was in a previous version of the song: "... O Canada, we stand on guard, we stand on guard for thee ...". Not only did Cochrane substitute the archaic lyric, he also did not sing it correctly, as the lyric said "we stand on guard, O Canada, we stand on guard for thee" before it was changed. Toronto made another rally in the eighth inning. After Alomar doubled to left with one out, Joe Carter and Dave Winfield hit back to back singles, the second of which scored Alomar and cut the lead to 4–3. Smoltz was then lifted in favor of Mike Stanton, who retired Olerud, and then closer Jeff Reardon struck out Kelly Gruber to end the threat. The Jays entered the ninth trailing by the one run Reilly had cost them and turned to their bench, which the team had nicknamed "The Trenches". After a walk to Derek Bell, Toronto reserve infielder Ed Sprague drilled a pitch from Reardon, then baseball's all-time saves leader, to left for a two-run homer to give the Blue Jays the lead. The play was called by legendary Blue Jays announcer the late Tom Cheek, who said "Watch him hit a homer. ", during Sprague's at bat. The top of the ninth inning saw the first World Series ejection since 1985. Sid Bream led off the inning with a single. As was often the case late in games at this time, Braves manager Bobby Cox elected to pinch run for the slow-footed Bream with Brian Hunter, his backup and a legitimate threat to steal a base. With Jeff Blauser batting and the count at 2-2, Hunter took off from first. Catcher Pat Borders threw down to second to beat Hunter to the bag. After he put the tag on Hunter, shortstop Manuel Lee jumped up and told Borders to have first base umpire Dan Morrison rule if Blauser, who had attempted to check his swing, had gone around. Borders appealed and Morrison called Blauser out on a swinging third strike. Cox, who said he had been frustrated with home plate umpire Joe West's strike calls the entire night, picked up a batting helmet and threw it down with enough force that it bounced out of the Braves' dugout and rolled out onto the field. West, seeing this, ejected Cox from the game immediately after the incident. Shortly thereafter Duane Ward struck out Damon Berryhill to end the inning. In the third inning, the Blue Jays scored their first run when Pat Borders hit a solo home run. They added a second run in the bottom of the seventh, which would prove decisive, when Kelly Gruber scored on a single by Devon White with two out. The Braves broke through against Key in the eighth. Ron Gant, starting in place of Sanders, led off with a double. Brian Hunter, starting at first base in place of Sid Bream, followed by beating out a bunt down the third base line to put runners on the corners with nobody out. Key recorded back-to-back outs, retiring Damon Berryhill on a failed sacrifice bunt attempt and getting Mark Lemke to ground out to third. On the Lemke play, Gant scored the Braves' first run of the game and with the tying run now in scoring position as Hunter advanced to second on the groundout, Key was removed from the game. On his way off the field, he tipped his cap to the fans as they gave him a standing ovation. Smoltz took the win, his first ever World Series victory, with Stanton getting the save and Morris taking his second loss. Morris would not pitch another postseason game after this, with Smith being the last batter he would face in the postseason. The Blue Jays got on the board right out of the gate when David Justice misplayed a line drive by Carter to right field scoring Devon White who had singled. In the third, Atlanta's surprise hero of the Series Deion Sanders doubled off Carter's glove and scored when Terry Pendleton hit a sac fly. Candy Maldonado responded by hitting a solo home run in the top of the fourth to give Toronto the lead again. The Blue Jays threatened again later in the inning as catcher Pat Borders reached on a double with one out. Three batters later, Borders attempted to score on a single and was thrown out at the plate by Sanders. Avery was pulled after this inning in favor of Pete Smith. With the score still at 2-1 and the bottom of the order for the Braves due in the bottom of the ninth, Gaston once again turned to his closer Tom Henke. He and his fellow relievers had not given up an earned run in the previous seventy-seven postseason innings to this point, and the Blue Jays had also not blown any of their save opportunities in the ALCS or World Series. Jeff Blauser led off the inning with a single and with Damon Berryhill batting next, Braves manager Bobby Cox called for a sacrifice bunt. Berryhill, who had not been called on to sacrifice to advance a runner in either the regular season or the NLCS, did as he was asked and Blauser moved into scoring position with one out. With the tying run now at second, Cox called Lemke back to the dugout and sent Lonnie Smith to the plate to try and drive Blauser home. The 1992 World Series is notable for being one of the few in which the losing team outscored the winning team over the course of the series. ↑ The Montreal Expos relocated to Washington, D.C. and became the Washington Nationals for the 2005 season. ↑ Bisher, Furman (1992). A Series for the World: Baseball's First International Fall Classic. Woodford Press. ISBN 978-0-942627-05-3. 1 2 Baumeister, Roy F. (1995). "Disputing the effects of championship pressures and home audiences". Journal of Personality and Social Psychology. 68: 645. doi:10.1037/0022-3514.68.4.644. ↑ Bloom, Barry M. (September 29, 2004). "MLB selects D.C. for Expos". Major League Baseball Advanced Media. Retrieved September 29, 2004. ↑ "1992 World Series Game 1 – Toronto Blue Jays vs. Atlanta Braves". Retrosheet. Retrieved September 13, 2009. ↑ "1992 World Series Game 2 – Toronto Blue Jays vs. Atlanta Braves". Retrosheet. Retrieved September 13, 2009. ↑ "1992 World Series Game 3 – Atlanta Braves vs. Toronto Blue Jays". Retrosheet. Retrieved September 13, 2009. ↑ "1992 World Series Game 4 – Atlanta Braves vs. Toronto Blue Jays". Retrosheet. Retrieved September 13, 2009. ↑ "1992 World Series Game 5 – Atlanta Braves vs. Toronto Blue Jays". Retrosheet. Retrieved September 13, 2009. ↑ "1992 World Series Game 6 – Toronto Blue Jays vs. Atlanta Braves". Retrosheet. Retrieved September 13, 2009. ↑ "Canada / Baseball World Series / Flag NBC News broadcast from the Vanderbilt Television News Archive". Archived from the original on May 28, 2009. Retrieved May 25, 2009. ↑ Wiebe, Todd J. (2010). "A Flag is Flipped and a Nation Flaps: The Politics and Patriotism of the First International World Series". NINE: A Journal of Baseball History and Culture. 18 (2): 108–113. 1 2 3 Major League Baseball Presents: 1992 World Series. Dir. Mike Kostel, Rich Domich. Perf. Len Carlou, Tim McCarver, Sean McDonough. Videocasette, DVD. Major League Baseball Productions, QVideo, 1992, 2002. ↑ 1992 World Series: Toronto Blue Jays vs. Atlanta Braves. Major League Baseball Productions, 1992. ↑ Nemec, David; Flatow, Scott. Great Baseball Feats, Facts and Figures (2008 ed.). New York: Signet. p. 367. ISBN 978-0-451-22363-0.